Have you inserted a shape into your Google Slides or Drawing, and wish you could modify it somewhat? You can! This doesn't appear to be a widely known tool but once you know what to look for, you won't pass it up again! Go ahead ... insert a shape. 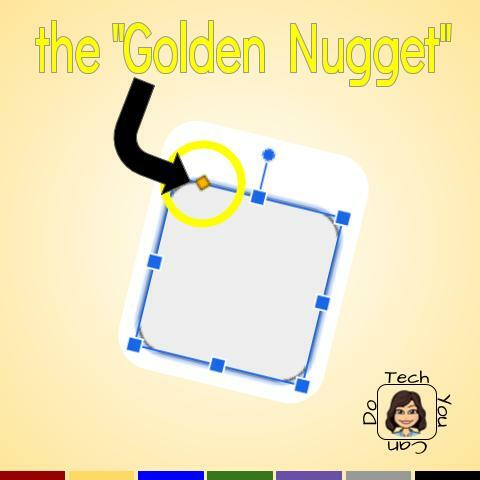 Look for the tiny "golden nugget". (P.s. some shapes have more than one!) If you see a golden nugget, click on it and move it. You can adjust the shapes! Don't be afraid to check out what the "golden nugget" can do for you on other shapes, too! 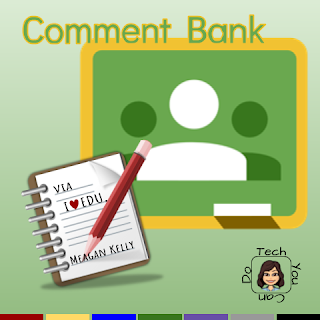 Today is all about a new-ish feature in Google Classroom ... its comment bank. This bank has some real potential for teachers. If you are a Classroom user, be sure to check this one out. Meagan Kelly, a Google Innovator, has put together a quick and easy to read article about the comment bank. Be sure to poke around Meagan's blog, too. She has shared out some pretty awesome ideas, activities, and helps for teachers. I got hooked on Meagan's blog when I read "Escape the Dungeon! A BreakoutEdu Digital on Area of Shapes", an amazing digital breakout to assess students on their knowledge & ability to apply area formulas. If you are a math teacher (roughly 7th/8th grade), you'll want to check that article for sure! I've been a big fan of John Spencer for awhile now - his blog, his podcast "The Creative Classroom", and his books. 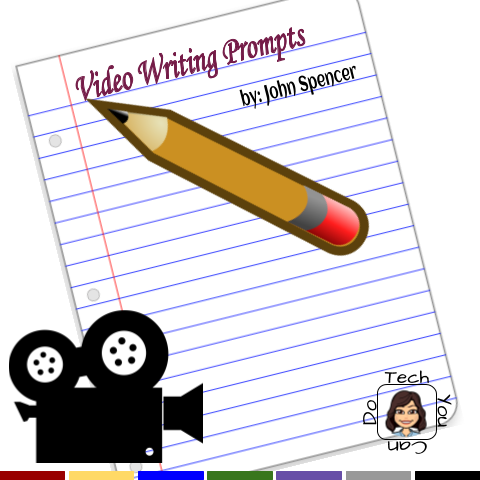 When I heard about Video Writing Prompts, I was thrilled! I watched several of them & I had classroom envy ... I don't have my own class any more, but I would have LOVED to have had these when I taught 5th grade ELA! These videos are short (I think the longest one is still less than 3 minutes) and easy to watch. John has set up an entire website for this creative project. You not only get the videos, he provides reasoning, how to use these writing prompts, AND, in his FAQ's, he explains how he creates them! Currently, he has 9 genres of writing prompts. NINE. Genres. You can also find them on his Video Writing Prompts YouTube Channel (LINK). But don't worry, he is so thorough, he also provides instructions and the ability to download the videos for use in schools where YouTube is restricted. Honestly, is there anything he HASN'T thought of? Oh wait, he shares his email address if you'd like to submit a potential idea for a writing prompt. 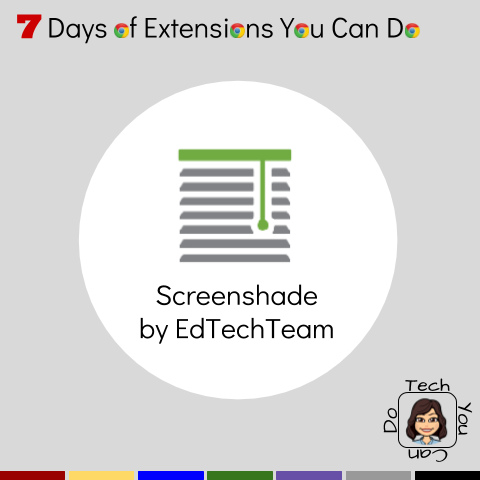 WHY I USE THIS EXTENSION ↬ ScreenShade is going to be an asset to classrooms every where! If you aren't already using this, I promise it won't take much to win you over. This extension makes it super easy to cover all, or part of your browser screen. HOW I USE THIS EXTENSION ↬ the next time you are displaying your browser, and want to keep your students in suspense, turn on the ScreenShade and let it give you the ability to peel back as much or as little as you want. There is even a timer you can set so that the screen goes away completely when the time is up! Math class: want to have a problem already worked out? Use screenshade to peel back one step at a time. How about showing a small selection of problems for your students and as they are ready, peel back the screen for more? Science class: reveal steps to a lab one at a time so students do things in the right order; show only part of a chart/graph. ELA class: show students a short selection from a book or article so they can predict or infer what is going to happen. Use a graphic organizer and only reveal a portion. I'd be willing to bet you can come up with a bunch of other uses in your classroom! Enjoy! 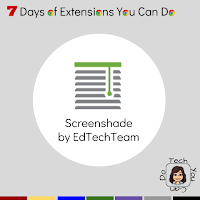 I hope I've convinced you to give the ScreenShade by EdTechTeam extension a try! 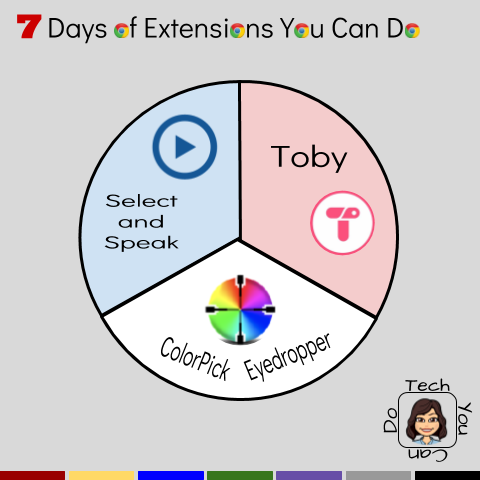 If this extension is exciting you, be sure to check out the others on my blog, "7 Days of Extensions You Can Do". 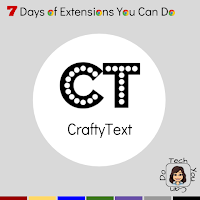 WHY I USE THIS EXTENSION ↬ CraftyText is not an extension I use on a daily basis, but rather on occasion to display a short message to an audience. HOW I USE THIS EXTENSION ↬ staying on whatever site I need to be, click the extension and type the message/phrase/text and then enter. The text will display as an overlay on my screen. It will remain there until I click on the extension again. WITH STUDENTS: I might use CraftyText for a couple of reasons ... to join a Google Classroom, to provide a code, or to share a quick message. 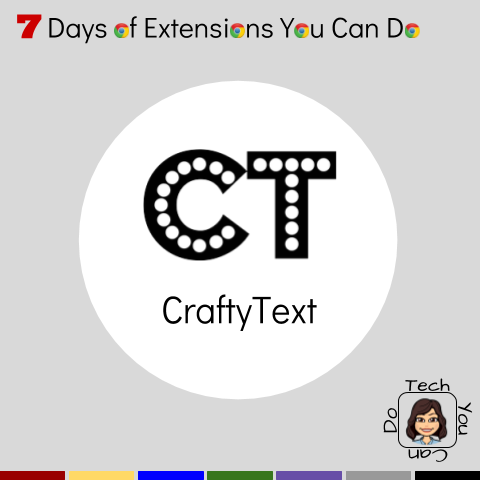 I hope I've convinced you to give the CraftyText extension a try! 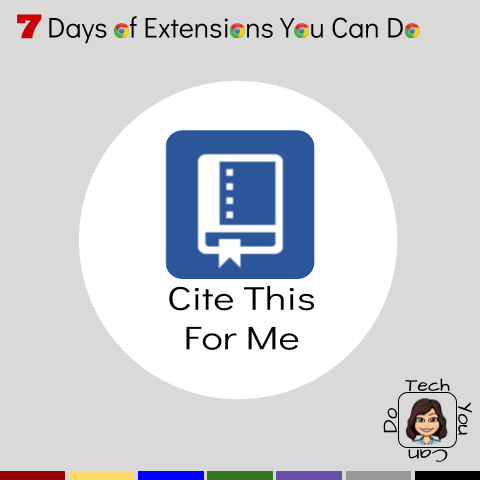 If this extension is exciting you, be sure to check out the others on my blog, "7 Days of Extensions You Can Do". Day 5: Thursday Throwback ... it's a 3-fer! On Thursday's, I try to do a "throwback" and re-highlight a previous post. In keeping with this week's theme of extensions, I've gathered THREE throwbacks to previous posts on some of my favorite extensions. Enjoy! WHY I USE THIS EXTENSION ↬ this is extension is a game-changer!!! The power is truly for students to be able to listen to pretty much anything on the web, AND it works nicely for teachers, too, since we have to read digitally as well. It kinda of turns your web browser into an audiobook 'on demand'! The way this extension works is to open a web browser, select the word, paragraph, or entire article, then click on the extension and turn on your volume. The extension looks like a play button and changes into a pause button while it is reading. READ MORE HERE ↬ "5 Top Google Chrome Extensions You Can ... and Should ... Do"
WHY I USE THIS EXTENSION ↬ to organize myself and keep links, resources, activities grouped together. Using Toby allows me to open up each "collection" at one time with a single click. It's very much like a folder on my bookmarks bar, but I can open them all at one time. Collections can also be shared with others, so you & your colleagues can help each other stay organized. READ MORE HERE ↬ "Day 7: Toby Extension"
WHY I USE THIS EXTENSION ↬ this one is for me to match up colors to the exact hue of whatever project I am working on! LOVE LOVE LOVE! Click the extension, hover over the color on your computer screen & copy the specific hex number. Paste that into the custom area for your background, text, shape or line color and voilá!!!! Perfect match! READ MORE HERE ↬ "Day 10: ColorPick Eyedropper extension"
I hope I've convinced you to give at least ONE of these extensions a try! 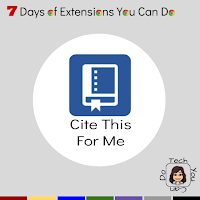 If these extensions are exciting to you, be sure to check out the others on my blog, "7 Days of Extensions You Can Do". WHY I USE THIS EXTENSION ↬ to easily, quickly, and accurately cite sources on the web. Where was this when I was in college?!?! I recently had a discussion with another teacher regarding students and citations. Which citation do we teach? How do we teach it? At what age? And so on. Here's my opinion ... bottom line, we NEED to teach students TO cite. I do not believe there is a "right" way - MLA, APA, Harvard, Chicago, etc ... pick which ever you prefer. From a young age, students need to be taught they can't just take anything off the internet and include it in their work. (I honestly do NOT believe students have the malicious intention of passing someones work off as theirs, it's just easy to do. Copy and paste, right?) But how to do this without wanting to pull your hair out? Cite This for Me extension is the answer! HOW I USE THIS EXTENSION ↬ If I am working with a group of students, having this extension is really awesome because the stress of creating a perfect citation is gone. Once a student is on the website they are using in their work, click on the extension, select the style of citation format needed. From here, it's as simple as grabbing the citation and dragging it over to the document and drop it right on the page. Done. When I show this extension to teachers, the reaction is half-disbelief and half-excitement. I always smile really big and say, "Man! Where was this in college!?!? I sweated over citations and I never got them right!" This also demonstrates a subtle shift for us as teachers ... there are some things we can "let go of" without really losing anything. Spend that energy teaching students better searching or crafting a better paragraph or finding another creative way to display their work. I hope I've convinced you to give the Cite This for Me extension a try! If this extension is exciting you, be sure to check out the others on my blog, "7 Days of Extensions You Can Do".